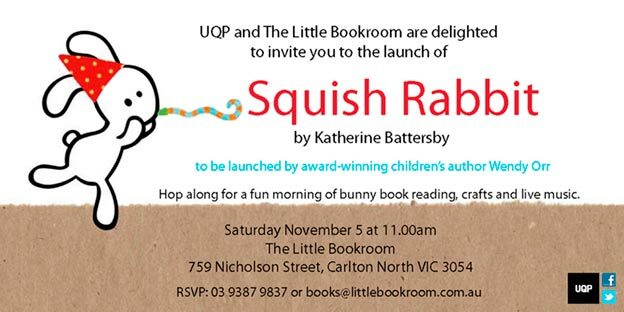 Squish and I would love to see all you Melbournites at The Little Bookroom for our morning of Squishy celebrations. The book will be launched by talented author (and all-round lovely person) Wendy Orr, who wrote Nim’s Island as well as one of my current favourite picture books, The Princess and her Panther. There’ll also be plenty of fun for cotton tailed kids and adults, with live music, an illustration demonstration, a book reading and craft table. Hope to see you there! This story is illustrated by a mix of collage and drawing giving it a rich layered texture that is both as inviting and delightful as a long, warm hug. It’s always a pleasure to find an author who understands that childhood is not all sunshine and birthday parties; that children sometimes feel loneliness, and feel it deeply. “Squish Rabbit,” however, is not dark in the slightest; it’s matter-of-fact and elegant in its emotional honesty … I highly recommend it as a thoughtful read-aloud, even for the wee ones. Boomerang Books is my pick of online Australian bookstores, and over at their Kids’ Book Capers blog they’re currently celebrating a week of literary rabbits. The lovely Tania McCartney has just interviewed Squish – she asks some really sweet questions and does a beautiful job of hosting this little cartoon rabbit. 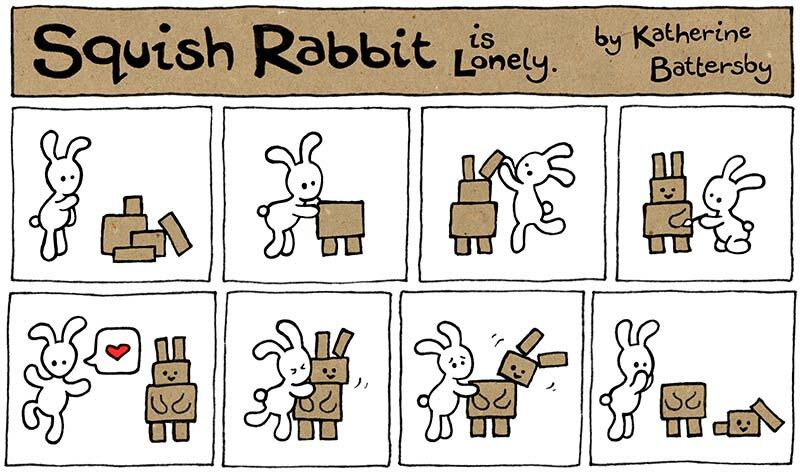 If you read the interview you’ll also get a sneak peek of Squish Rabbit’s second book (which should be coming out August 2012). Kids’ Book Capers’ other resident blogger and fellow rabbit lover, Dee White, has also interviewed me as well as done a lovely book review here. I have been holed up in my writerly burrow, working to deadline on book 2. I’ve been researching the shape of a squirrel’s paws, quietly observing the oddities of chickens, and creeping back into the mind of one very small rabbit. What fun.